If ever there was a book more timely . . . 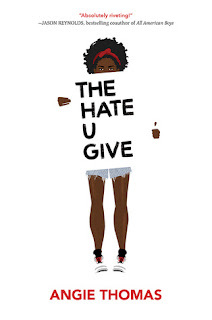 The Hate U Give caught my attention even before I received it in my subscription box a few months ago, and so I didn't waste time getting to it. And you shouldn't either if you haven't read it yet. Please do. I don't know what to write about this book. Whatever I say won't do it any justice. It's one of those books I hope will become required reading in school. For anyone really. Books like this are one of the big reasons I read. They are thought provoking, eye-opening, emotional roller-coasters, and bring reality home in a way that only fiction can. Starr Carter lives in two worlds. She grew up in and lives in a poor urban neighborhood, and goes to a predominantly white suburban prep school. She acts differently depending on where she is, doing her best to fit in. The careful balance she has created between her two lives comes crashing down when she is the sole witness to the death of her childhood friend, Khalil, who is killed by a police officer during a traffic stop. I have so much love for Starr. My heart hurt for her. Author Angie Thomas made me feel Starr's pain and anger, and her fear and frustration as she tried to hold it together. She really struggles with what to do, whether to remain quiet, knowing the fallout that will come if she does speak out, or to give voice to what happened that night and about just who Khalil was. Starr's family is extremely supportive of her, and I am so glad she had them to help hold her up. One of the things I especially liked about this novel is how all encompassing it is in terms of providing varying viewpoints, from the individuals in the neighborhood to those outside of it looking in, as well as the community as a whole. We see the strain of it all on Starr's uncle, a police officer himself. Starr learns who her true friends are the more people in both her worlds, both white and black, discover her involvement in what went down. Then there are the struggles her parents face individually and in protecting her and their family. The threats from a local gang leader, the uniting of rival gangs to protect their neighbors, the rioting, the community activists trying to make a difference . . . And that young man, a boy even, unarmed, who lost his life because of the color of his skin. The Hate U Give is relevant to today, opening the door to much needed discussion about police shootings and race relations. It is also about the bonds of family and community, about self-identity, friendship, and so much more. This book is a giant emotional roller-coaster, taking me through all the emotions. I highly recommend it. You can learn more about Angie Thomas and her books on the author's website. I've this book in my pile and after reading your insightful review it has helped move up on my to-read list. I like it that a book not only evoke many emotions in a reader but also offer some thought provoking issue to think and talk about, especially issues as mentioned in this book. Melody - I hope you enjoy it, Melody. I think it presents a worthwhile viewpoint of American culture. A sad, but accurate one that needs to be talked about. I keep hearing about this book but haven't gotten round to reading it. After your review, I feel like I must step up my efforts to find a copy to borrow! Eustacia - I hope you do read it. I would like to know your take on it. I also thought that it should be required reading! Jill - It really should be. I am anxious to read Dear Martin. I hear it is a must read as well. I agree with you! I listened to this on audio and the narrator did a fabulous job. Kathy - I bet this was great in audio! I may re-visit it in audio someday. I think it'd be worth it. I've heard so much about this one! Thanks for a great review! Jenclair - I really liked it! This is the type of book that, as you say, should be required reading for EVERYONE. Yet, I am hesitant to read it, because I know I will suffer if I do. I will cry. I will feel despair and fear. I will, in a word, suffer, right along with the characters. However, I definitely know I MUST read it, because it's important for me to so so. It's important for me to understand and feel what these characters feel. I want to be in solidarity with them. I want to get inside their skin. Thank you so much for your insightful thoughts, Wendy! I'm bumping this book up on my TBR! Maria - It is definitely a book that will make many people uncomfortable, and I think that is part of the point. I don't know how much we are going back in time race relation wise as just becoming more aware of what has always been. It's just more out in the open now, more visible. I do think more people feel more free to express their prejudice out loud thanks to our current political climate, which adds to it, unfortunately. I think awareness is key--as well as not remaining silent in the face of injustice. If you do decide to read it, I hope you enjoy it. Everyone has good things to say about this one. It's on my ever growing list. Ti - I hope you do get a chance to read this one. Wendy, I've been hearing about the quality of this book since its release and isn't it also being made into a movie? I do think this is a topic that needs to be discussed in the hopes that it can help with awareness and perhaps some kind of improvement in training for (and screening of) police to help minimize these things from happening . What I can say about this, from firsthand experience in having been married to a city cop, is that if it's not something a video clearly shows wrongness or some measure of brutality on an officer’s part, you canNOT trust that the reporting (usually print and short entries) of an issue like this reveals the WHOLE truth about situations. I don’t know percentages, but many cases in which these things happen do have actual reasons behind it that have nothing to do with skin color, whether it's a mistake or poor judgment (by either party) OR a move on the innocent person (regardless of color) which literally "triggers" a response from a policeman to believe he/she is retrieving a weapon when they may be unarmed, which an officer can’t know unless there was prior gunfire, etc. There's a reason for the "hands above your head" or "keep your hands visible" statement, certainly in car stops. Even when someone gets pulled over for a ticket, every time an officer approaches a car, they are trained to do it with caution. How many times do we hear that officers are shot and killed when pulling someone over? Also too often. If it's a case in which a high-speed car chase is happening, the person/people fleeing are literally putting any innocent people along the way, and the officers themselves at extreme risk for injury from minor to death, those fleeing only considering themselves and their own escape. These type situations are extremely high-danger, high-adrenaline ones. I'm not saying this to invalidate situations where, in fact, a stereotypical perception could have led to the tragedy of an unnecessary death :( , but to point out that many times the officers' responses may have been with what they deemed as "good reason" in that specific moment/situation which are very often split-second decisions and sometimes end in tragedy for both sides—the victim’s AND the officer’s— to deal with. It's an extraordinarily difficult job to do. Being human, perfection is simply impossible, but most people naturally want someone to “pay,” and sometimes “blame” can be on either/both sides as to what triggered the tragic event. Ultimately everyone (unless you’re dealing with someone truly heartless, which also happens) pays on all sides with heartbreak that lasts lifelong :( . I haven't read the book, and don't know what the details are of the killing she describes in the book, so don't know who is guilty or innocent of what, but it sounds like the author really tried to show varying viewpoints. I wonder---though we do get a policeman’s viewpoint through her uncle, do we also get the perspective of the officer who did the shooting? Donna Marie - Thank you for your thoughtful comment. My cousin is retired now, but was a career police officer. I work closely with the local police and sheriff's departments through my work. I know what a difficult job it is and can be. Even in my own job, now and when I was in the field doing investigations, not everything is clear cut--most things aren't. I also know first hand how the media can play up one piece of a story over another just because it gets them more ratings--and that certain aspects of investigations are confidential and so cannot be shared with the media or public, thereby limiting the knowledge the public has of any situation. In many respects, you are preaching to the choir here. However, when you have an entire segment of society standing up and saying something is off, something is wrong, it's time to take a closer look and listen--really listen. Systematic racism and racism in general are ingrained in our culture and society, and it's a real problem. It goes beyond the subject of police shootings and violence on our streets. Which is what this book points out. Yes, the book centers around a police shooting of a young black man. But that is not just what this novel is about. It's about more than that. A book like this is a great opening to a conversation that needs to be had. Not to take sides, but to really listen to understand how we got to this point, why it is happening, and how we can come together to fix it. Agreed! It's a real problem. I think the main point I was trying to make is that way too often, in order to try to "fix" a problem, the pendulum swings way too far in one direction and results in a great deal of unfairness/injustice. I don't like to talk about my work here on my blog, and frankly, I can't really because of the confidentiality of the cases I deal with. My own agency and agencies like mine face similar accusations and fall out and criticism from society that law enforcement does--and dare I say, sometimes worse. We are a governmental enforcement agency of a sort as well. Although our purposes are different (although sometimes align), I come to it from that perspective. I know what it is like to be considered the "bad guy" when I am only trying to help society and protect the innocent. I also know the system I am a part of is severely flawed and people within are constantly working to fix it and make it better. Outsiders can't always see that--they don't always want to. So, I get it. I am sure it is the same with law enforcement. Unfortunately, one or multiple bad experiences can make a lasting impression on someone, and when you are used to being looked down on and treated poorly because of the color of your skin or your economic status not just by individual people but by society as a whole (including systematic racism), it's no wonder there is a wide distrust for those in authority. Add to that fact that no one seems to care nor actively seeks to make positive changes. Especially not those with the real power to change anything. As I have said, I have a lot of respect for law enforcement in general and have worked closely with them over the years, but I have encountered poor (uneducated, misinformed, biased, prejudiced, burnt out--take your pick) cops in my 20 years on the job--and in my personal life. You're right that no one should paint all cops as bad. Most aren't. But the fact remains that by saying most cops are good and that we should not focus on the bad ones at all, we are in essence telling those who have been wronged by law enforcement that they don't matter. Instead of just saying don't blame all law enforcement for the bad seeds, law enforcement agencies need to take responsibility for the bad seeds they do have, admit when they do wrong, and the system needs justice to be served. Some would argue the percentage of actual racial discrimination by police is low. And maybe that's true. But the fact that it exists in the first place needs to be addressed. Things would have gone a lot better for the Catholic Church had they been upfront about the child molesting priests in their ranks (which were actually very few and far in between), apologized and taken action to protect their young congregation instead of covering everything up and protecting the perpetrators. You mentioned in your original comment that your google search resulted in movies and stories about cops versus innocent people. When I look up stories in the media, I see a definite bias toward white people as compared to people of color--in the language used and the photos shared. Like you, I don't see the fairness--only we disagree about its direction. It's a complicated issue. And I think all sides need to be taken into account. There is no quick fix, but ALL sides need to be willing to sit and the table, admit culpability/responsibility and be willing to make changes. People need to have an open and honest dialogue. That's why I think books like this are important. It puts the issue out there in such a way as to make people, especially someone like me, a white middle class person who cannot possibly understand what it is like to be a person of color, take a closer look at my own beliefs, thought processes and behaviors. One of the reasons I love reading fiction is because it brings home the human side of a situation or dilemma. Stepping into someone else's shoes can be very revealing, even uncomfortable, but helps build empathy and opens the way to real communication. It's less an us vs. them thing and more of a me and you sort of thing. I'm really tired of the us versus them argument. I personally do not think this is a one side or the other issue. It's an us issue. Us as in our society. If we really want to strive toward fairness and justice, we have to be open to listening to all sides, take responsibility for our actions--or inaction--and actively work to make things better. And stop just talking about it. All so eloquently stated, Wendy :) I too get really tired of the constant pointing of fingers and blame, regardless of who's fingers they are or what color. I think there is more discussion and I think there will be a portion of people who will be positively affected by it. I just have no confidence that humankind, in general, is capable of balance and fairness in a lasting and meaningful way :-\ And I totally agree with the power of fiction when written well, it's probably its greatest value, to enable us to walk in another's shoes and increase understanding. It's sorely lacking. The sorry fact is that a lot of people either can't understand or don't want to. This is what creates the problems to begin with. Jenea - It is! I hope you get a chance to read it. I feel like this has been *the* book of the year, the one I see talked about the most -- and I'm going to make it a point to get to it before the end of 2017. I'm glad to see you gave it a recommendation! Lindsay - It does seem to be one of the popular ones this year--and I think it is well deserved. It opens a conversation I think we, as a country, need to have. I have some of the same questions WriterSideUp had in her comment. I have a cousin who was a police officer killed in the line of duty but I have another cousin who was the St. Louis Post-Dispatch reporter arrested covering the protests in St. Louis so I feel like this is an issue where my loyalties are really divided but they shouldn't be. Right is right, justice is justice. I've heard a lot of really positive buzz on this one and your review was really fantastic. I'm hesitating to read this one because you know I don't like heavy books but at the same time it isn't one I feel like I can ignore. Great review! Katherine - I am so sorry about your cousin. I have a lot of respect for law enforcement--having friends and family members among there numbers and in working closely with them for the past 20 years through my job. I love that The Hate U Give brings out so many of these feelings and thoughts we've been having. It makes us feel uncomfortable, yes, but I think it is a necessary part of addressing the very real issues out there that this book focuses on: that of discrimination and systematic racism. This book is about much more than one police shooting. I really think it's a book that needs to be read. I am so glad you enjoyed this one, Wendy. I bought it back in July and it has sat in my daughter's room since then. I may have to take it back because I don't think she is going to actually finish it. I live less than 10 miles from Ferguson near St. Louis. This is such a relevant and important topic. Carole - It's a great read, one I think more people should read. I hope you are able to get your copy back from your daughter! Great review Wendy! I need to read this book. Like you said, it's timely and hopefully books like this one will open up the dialogue so we can deal with the issues. Iliana - Thank you! I hope you get to read it soon. It's definitely worth it!